For every religious typology group, spending time with family ranks among the most meaningful aspects of life. But people also find fulfillment in many other places, including their careers, hobbies, friends, pets and religious faith. And the typology groups differ on these questions in a variety of ways. 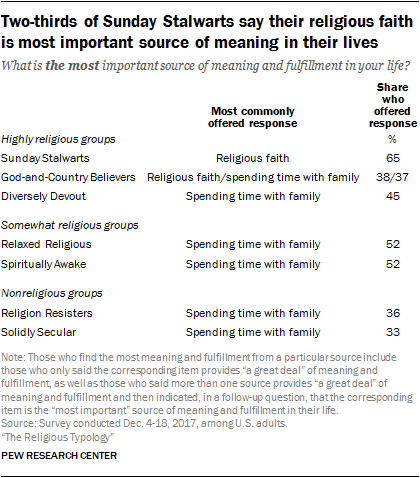 For example, the highly religious typology groups are much more likely than others to say they draw a great deal of meaning from their religious faith; in fact, a clear majority of Sunday Stalwarts say religion is the most important source of meaning in their lives. Religion Resisters, meanwhile, are more likely than most other groups to say being outdoors and listening to music are fulfilling for them. And the Solidly Secular are less likely to find fulfillment in many of the 15 possible sources offered by the survey, even though nearly all have nothing to do with religion. The groups generally agree that they look “a lot” to practical experience and common sense when making decisions about what is right and wrong. But again, there are differences in other areas: The highly religious typology groups are much more likely than others to turn to religious teachings for guidance about right and wrong, while some other groups are more likely to say they consider philosophy and reason or scientific information when making these decisions. Majorities of the highly religious groups also say their religious beliefs help them at least somewhat in coping with difficult times and doing the right thing, as well as in their interpersonal relationships (family and otherwise) and career pursuits. Most members of each typology group say it is at least somewhat important to belong to a community of people who share their values and beliefs, but the highly religious groups are especially likely to hold this view – including roughly nine-in-ten Sunday Stalwarts. The Sunday Stalwarts also are more likely than other groups to say they are engaged in the community through participation in various kinds of groups and activities, such as belonging to a charity or volunteer organization. 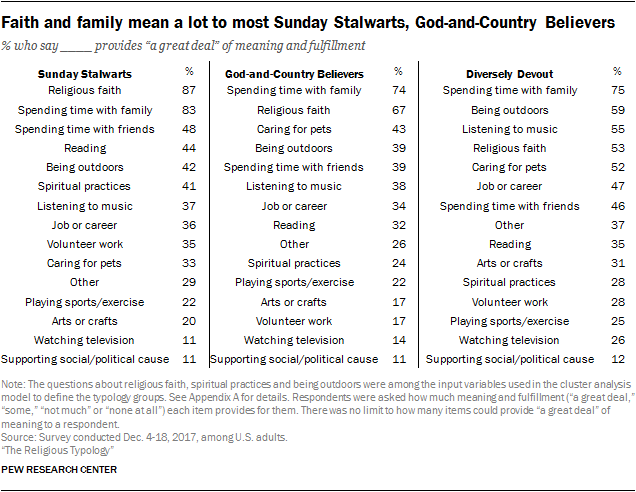 Sunday Stalwarts overwhelmingly say their religious faith provides them with a great deal of meaning and fulfillment, and a large majority say the same about spending time with family. Lower down the list, activities like spending time with friends (48%), reading (44%), being outdoors and experiencing nature (42%), and spiritual practices such as meditation (41%) provide some Sunday Stalwarts with a great deal of meaning. Like Sunday Stalwarts, most God-and-Country Believers and Diversely Devout draw a great deal of meaning and fulfillment from spending time with their family. And two-thirds of God-and-Country Believers (67%) derive a great deal of meaning from their religious faith. But compared with the other highly religious typology groups, the Diversely Devout are less likely to say their religious faith provides a great deal of meaning in their lives (53%) and more likely to say this about spending time outdoors and experiencing nature (59%), listening to music (55%), and caring for pets (52%). Spending time with family is the top source of meaning for both of the somewhat religious typology groups, with similar shares of both the Spiritually Awake (74%) and the Relaxed Religious (70%) saying that family time provides “a great deal” of meaning and fulfillment. No other item provides a great deal of meaning for a majority of the Relaxed Religious. Other sources of meaning near the top of the list for this group include spending time with friends (45%), caring for pets (44%), being outdoors and experiencing nature (36%) or listening to music (36%). The Spiritually Awake, meanwhile, are even more likely than the Relaxed Religious to gain a lot of meaning and fulfillment from being outdoors (58%), caring for pets (56%) and listening to music (51%). 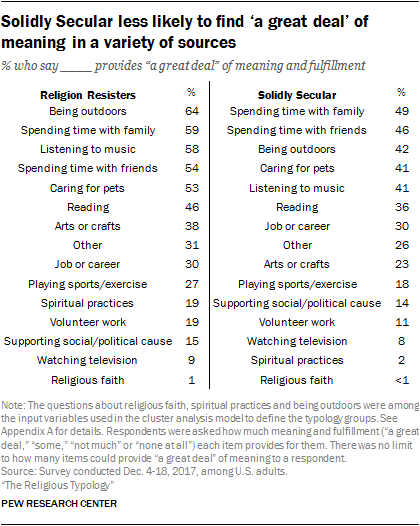 Majorities of Religion Resisters say being outdoors and experiencing nature (64%), spending time with family (59%) or listening to music (58%) provides them with a great deal of meaning and fulfillment. Spending time with friends, caring for pets or animals and reading also provide a great deal of meaning to roughly half of Religion Resisters. The things that top Religion Resisters’ list as sources of meaning and fulfillment also rank near the top for the Solidly Secular. But compared with Religion Resisters – and the other typology groups – somewhat smaller shares of the Solidly Secular derive a great deal of meaning from several of these sources, including spending time with family (59% among Religion Resisters vs. 49% among Solidly Secular), being outdoors (64% vs. 42%), caring for pets (53% vs. 41%), and listening to music (58% vs. 41%). And while hardly any adults sorted into these two groups derive fulfillment from religious faith, about one-in-five Religion Resisters find a great deal of meaning in spiritual practices like meditation, compared with just 2% of the Solidly Secular. Most respondents named more than one thing that provides “a great deal” of meaning in their lives, and they were asked a follow-up question: Which item provides the most meaning and fulfillment in their lives? The top choice among nearly every group is spending time with family, with two notable exceptions. Though a majority of Sunday Stalwarts say family time provides them with a great deal of meaning, two-thirds say their religious faith gives them the most meaning. And God-and-Country Believers are as likely to say their faith provides them with the most meaning (38%) as they are to say that spending time with family provides the most meaning and fulfillment in their lives (37%). Where do people turn for guidance when making decisions? In addition to sources of meaning in their lives, respondents were asked whether each of four potential sources of guidance – religious teachings and beliefs, philosophy and reason, practical experience and common sense, or scientific information – help them make decisions about right and wrong “a lot,” “some,” “not much” or “not at all.” In response, three-quarters of Americans overall say they look “a lot” to practical experience and common sense. When making decisions about right and wrong, majorities in all of the typology groups turn to practical experience and common sense for guidance. But many people in the highly religious groups also look “a lot” to religious teachings and beliefs, including three-quarters of Sunday Stalwarts and two-thirds of God-and-Country Believers. 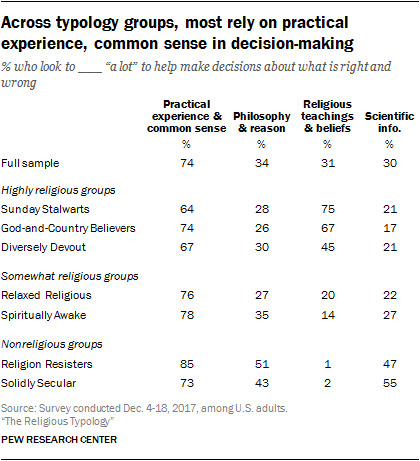 Religion Resisters are the only group in which at least half (51%) say they rely “a lot” on philosophy and reason for such matters, and the Solidly Secular are the only group in which upward of half (55%) look to scientific information for guidance on matters of right and wrong. When asked, in a follow-up question, which source they look to the most for guidance about right and wrong, fully half of U.S. adults say they rely mainly on practical experience and common sense.10 One-in-four rely primarily on religious teachings and beliefs (23%), while 7% look mostly to philosophy and reason, 6% look to scientific information, and 14% indicate that they do not rely a lot on any of these potential sources of guidance for deciding between right and wrong. Sunday Stalwarts and God-and-Country Believers are the only typology groups in which those who look primarily to religion for guidance about right and wrong outnumber those who look mainly to practical experience and common sense. In all other groups, half or more rely mainly on practical experience and common sense for guidance about right and wrong. Many Americans cite religious beliefs, broadly, as a key source of meaning and guidance in their lives. But in what specific ways is religion helpful to people – or not? The survey sought to answer that question by asking U.S. adults who identify with a religious group whether their religious beliefs are helpful in five different aspects of their life. Overall, most U.S. adults find religion at least somewhat helpful in coping with difficult times in life and in doing what’s right. About half say religion helps “a lot” or “some” in their family relationships, and in their relationships with friends and neighbors. And more than four-in-ten Americans (44%) say religion helps in the way they do their job or pursue their career. The highly religious typology groups – Sunday Stalwarts, God-and-Country Believers and the Diversely Devout – are the most likely to say their religious beliefs help them in each of these instances. Sunday Stalwarts in particular stand out: Virtually all say religion helps them at least somewhat in doing what’s right (98%) and coping with difficult times (97%), as well as in relationships with family and others (96% each), and a large majority (87%) say religion helps them in their career. Among God-and-Country Believers, too, roughly three-quarters or more credit religion with helping them in all of these areas. And about six-in-ten or more Diversely Devout Americans say the same. Additionally, many of the Relaxed Religious and Spiritually Awake also say religion helps in these areas – particularly with difficult times and tough decisions. These somewhat religious groups, however, tend to be less likely than the highly religious groups to say their beliefs help “a lot” in each of the five realms. Among the nonreligious, very few say religion helps in these ways. This partly reflects the fact that these questions were asked only of those who are affiliated with a religion. Roughly three-quarters of each of the nonreligious groups – Religion Resisters and the Solidly Secular – do not identify with a religious group, and therefore did not receive the questions on how religious beliefs help them in their day-to-day lives. But even looking only at those who are affiliated with a religion, Americans in the nonreligious typology groups are less likely than those in other groups to say religion helps them a lot in these various ways. About seven-in-ten Americans say it is at least somewhat important to them to belong to a community of people who share their values and beliefs, including 24% who say this is very important and 47% who say it is somewhat important to them. Majorities in all of the religious typology groups share this perspective, but it is especially common among the highly religious groups. Indeed, the vast majority of Sunday Stalwarts (89%) say belonging to a community that shares their beliefs is at least somewhat important to them, including roughly half (48%) who say it is very important. About eight-in-ten God-and-Country Believers (83%) and Diversely Devout (77%) say belonging to a like-minded community is at least somewhat important. Smaller majorities of those in other typology groups say it is important for them to belong to a community of people who share their values and beliefs. All Sunday Stalwarts are active in a church group or other kind of religious or spiritual organization. Indeed, involvement in a religious organization is one of the variables used in the cluster analysis, and their unanimity on this question is one of the things that defines the Sunday Stalwarts as a group. But Sunday Stalwarts also are among the most active in many other activities the survey explored. Four-in-ten say they participate in a charitable or volunteer organization – double the share of U.S. adults overall. And about one-in-five or more say they are part of a book club or study group, a community group or neighborhood association, or a parent or youth organization such as the PTA, Scouts or youth sports. Sunday Stalwarts are more likely than the general public to be involved in each of these activities. By virtue of their uniform involvement in a church group, fully 100% of Sunday Stalwarts indicate they are active in at least one of the 10 organizations or activities mentioned in the survey. 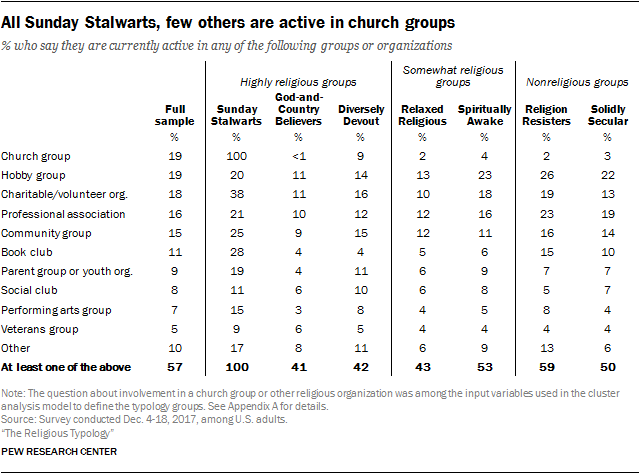 Even when religious organizations are removed from the equation, however, three-quarters of Sunday Stalwarts (75%) are active in the community in some way. By comparison, no more than about six-in-ten in any other typology group are involved with some type of organization.